Drive the vehicle through all gears. Stop → 1st → 2nd → 3rd → 4th → 5th → 5th (lock-up ON). Repeat the above driving pattern three times or more. The monitor status can be checked using the OBD II scan tool or intelligent tester. When using the intelligent tester, monitor status can be found in the "ENHANCED OBD II / DATA LIST" or under "CARB OBD II". In the event that the drive pattern must be interrupted (possibly due to traffic conditions or other factors), the drive pattern can be resumed and, in most cases, the monitor can be completed. HINT: *1: Drive at such a speed in the uppermost gear, to engage lock-up. 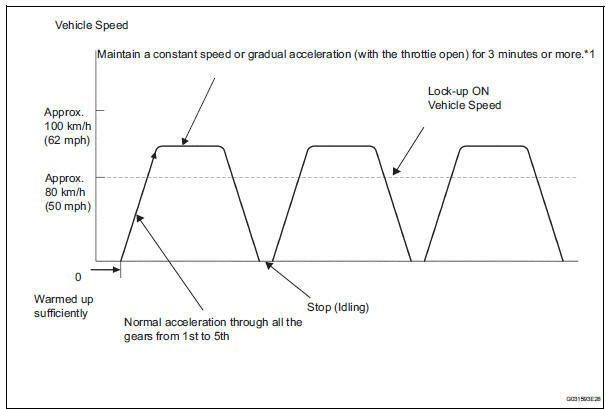 The vehicle can be driven at a speed lower than that in the above diagram under the lock-up condition. NOTICE: If necessary to drive the vehicle for approximately 30 minutes to detect DTC P0711 (ATF temperature sensor malfunction).